The station opened on 23 August 1916 as part of the extension of the Nord-Sud company's line A from Jules Joffrin. On 27 March 1931 line A became line 12 of the Métro. Porte de la Chapelle was the terminus of line 12 until 18 December 2012, when an extension opened to Front Populaire. An interchange with Paris tramway Line 3b opened on 15 December 2012. The tramway terminates at Porte de la Chapelle. ^ "M12 extension" (in French). RATP. Archived from the original on 20 November 2008. Retrieved 18 October 2009. 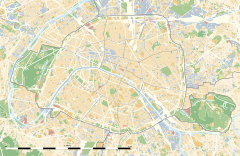 Wikimedia Commons has media related to Porte de la Chapelle (Paris Metro).